The last Beacon Rocks! 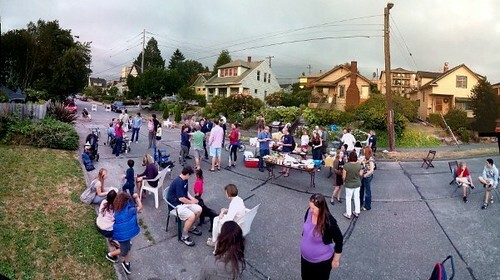 of 2012, a neighborhood Peach Party, the Neighborhood Night Out, and more, all captured in photos from the Beacon Hill Blog photo pool on Flickr. Thanks to those who have contributed! Do you have photos of life on Beacon Hill? You’re invited to add them to the pool, too! 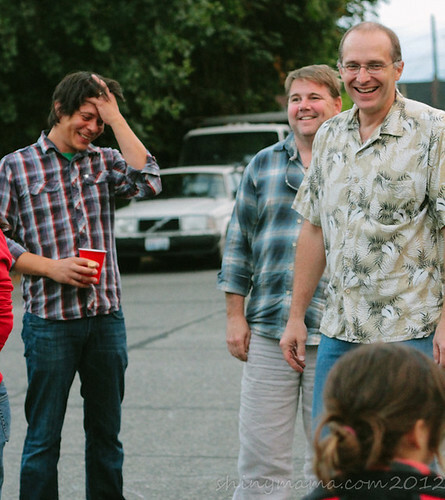 Neighbors enjoy themselves at the recent Beacon Hill Peach Party. Photo by Bridget Christian. 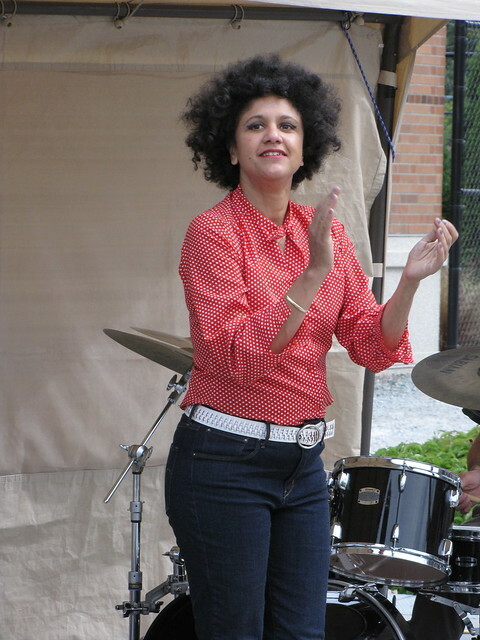 Annabella of Lushy claps to the beat at Beacon Rocks! Photo by Wendi Dunlap. 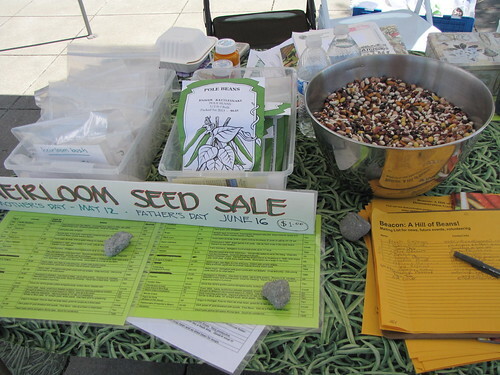 Neighbors took part in a “Backyard Barter” at Beacon Rocks!, trading homemade and homegrown food and veggies. Photo by Wendi Dunlap. 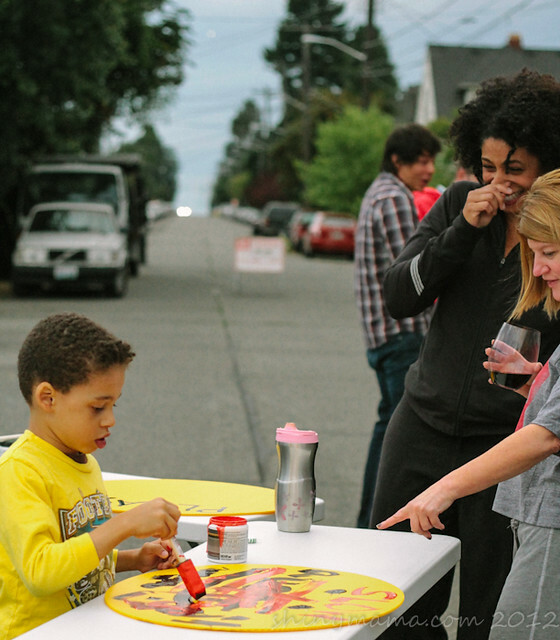 Some neighbors took over a neighborhood street earlier this month for the Beacon Hill Night Out. Photo by SergeyS87. 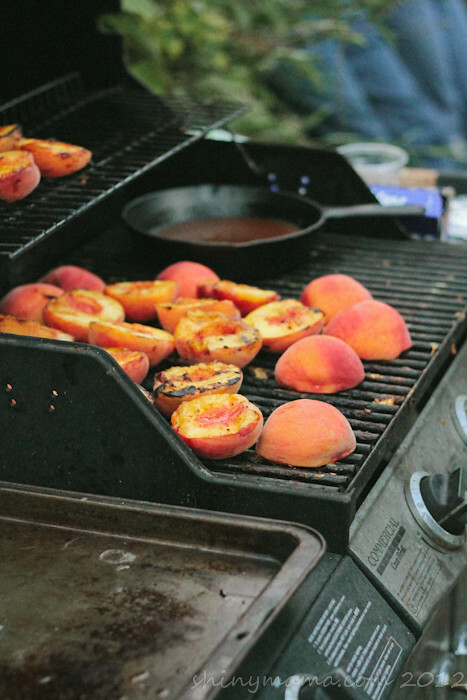 Grilling peaches at the Peach Party. Photo by Bridget Christian. 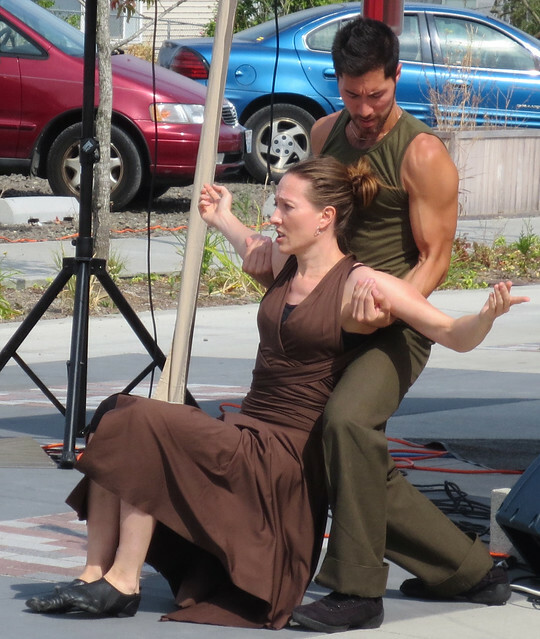 Dancers from Splinter Dance perform at Beacon Rocks! 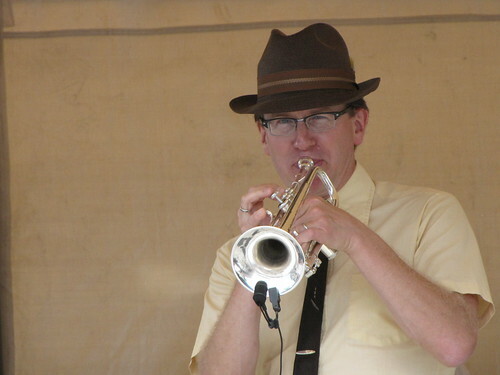 Photo by Beacon Hill Music. More fun at the Peach Party. Photo by Bridget Christian. Enjoying Tumbuka at Beacon Rocks! 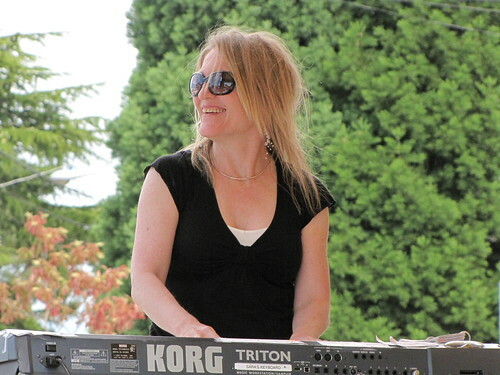 Photo by Beacon Hill Music. 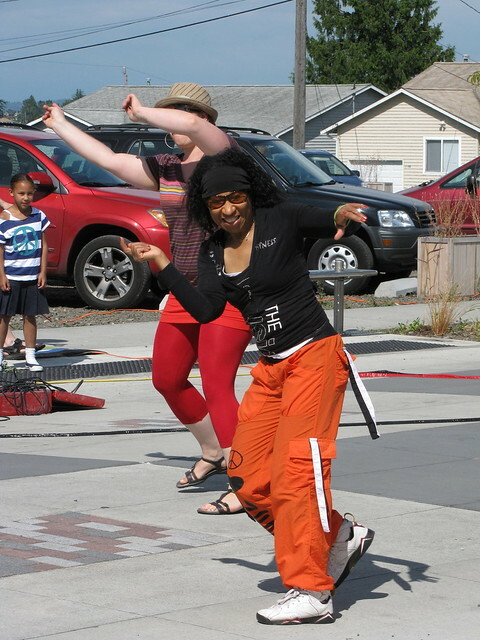 Fun and Zumba dance was enjoyed by all at July’s Beacon Rocks! Photo by Wendi Dunlap. 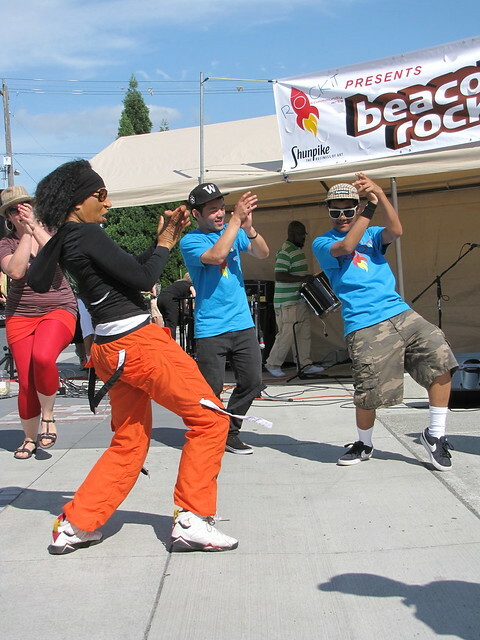 This Sunday, August 26 from 1-5 p.m., the last Beacon Rocks! 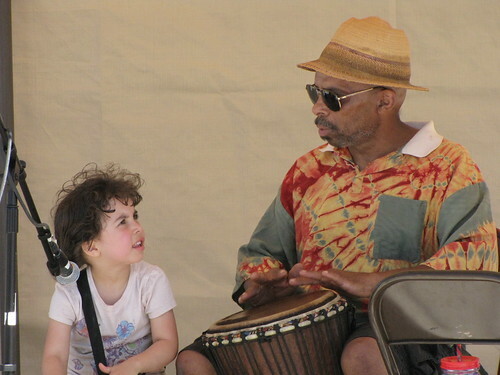 event of 2012 returns to Roberto Maestas Festival Street with music and dance performances, kids’ activities, vendors, and even some old-fashioned bartering. The lineup this time includes Jean Mann (“alt-folk indie-pop singer-songwriter”), Mister K and the Rhythm Rockets Kids’ Show (“Cab Calloway meets Mr. Rogers meets Vince Guaraldi”), Splinter Dance Company (“thought-provoking dance performances”), Lushy (“Cal Tjader meets Stereolab meets Brazil 66 in a bar in Berlin”), and Tumbuka (“a marimba band that plays African music drawn from traditional and contemporary styles”). 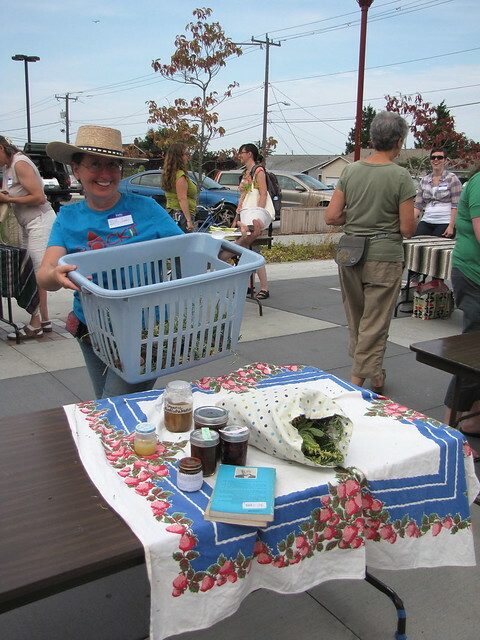 Representatives from the Beacon Food Forest will also be on hand with a presentation about the urban farming project currently being developed at Jefferson Park. 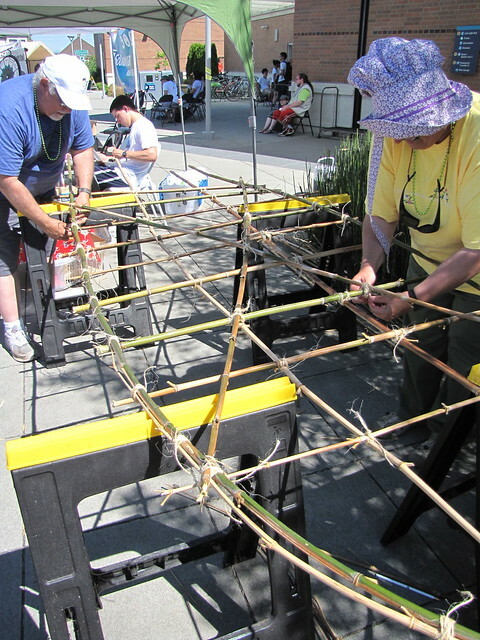 People for Puget Sound will also be there to demonstrate creative ways to reduce pollutants flowing into stormwater drains. 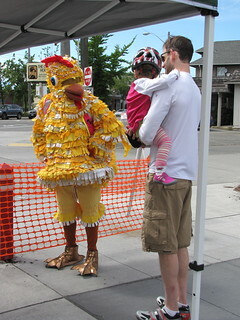 Here’s a video of Lushy performing at the Beacon Hill Piñata Party at Stevens Place Park in July 2010. The latest Beacon Rocks! 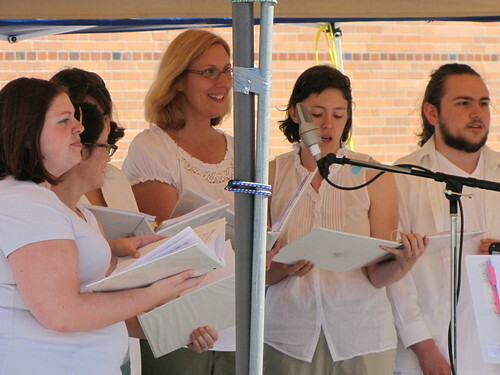 took place this Sunday under perfect blue skies. 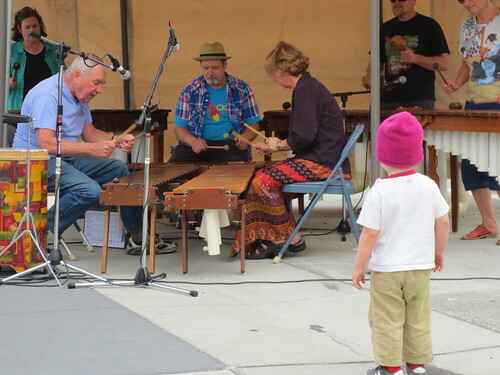 This installment of the music series had more vendors than any of the previous events—there were five or more food providers, along with vendors selling jewelry, greeting cards, and other items. There was a good crowd of neighbors in attendance and everybody seemed to be having a great time. The guest of honor: the whale weathervane from the Garden House. Funds are being raised to restore the whale and put it back in its place on top of the house. Photo by Wendi Dunlap. Save the Whale today at Beacon Rocks! Just a reminder that this month’s Beacon Rocks! 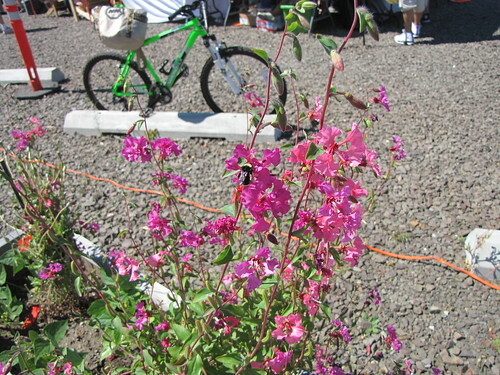 event is today from 1-5 p.m. on the Roberto Maestas Festival Street just north of Beacon Hill Station. The theme “Save the Whale”, with an afternoon full of performers, “mini-beach” wading pools, a volleyball contest, a “Save the Whale” haiku contest, visits by local whale biologists showing real whale bones, and more. We hear that there will be a new food vendor at the site this time as well: Honest Biscuits will be there with plain, sweet, and savory biscuits. See their typical menu here. As always, neighbors of all ages are welcome. Beacon Rocks! is a free event. Beacon Rocks! 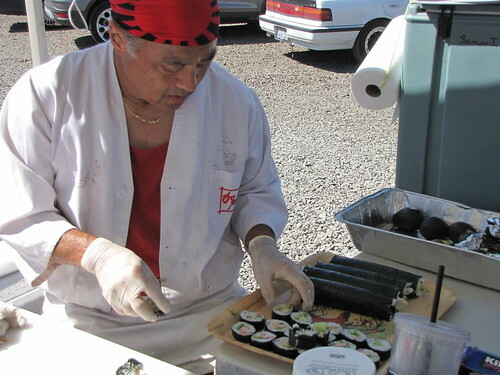 doesn’t just have performers and games — there are also some vendors. 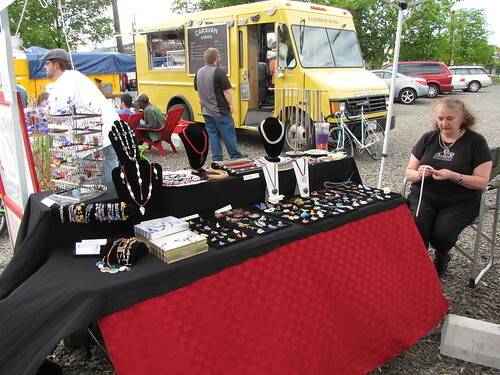 At last month’s event, neighbor Sandra sold beads and jewelry. Photo by Wendi Dunlap. 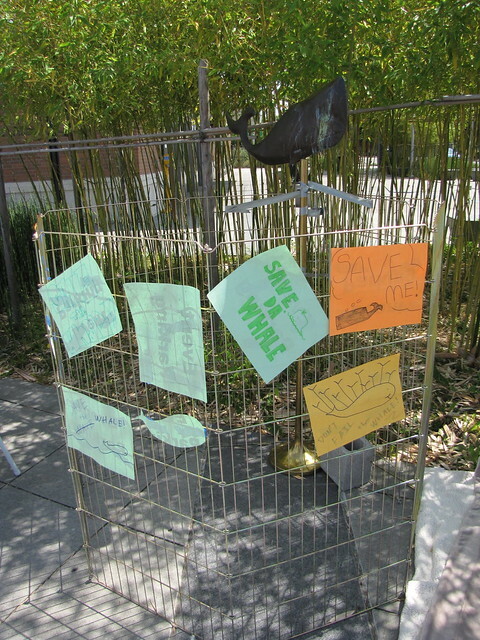 “Save the Whale” at this month’s Beacon Rocks! 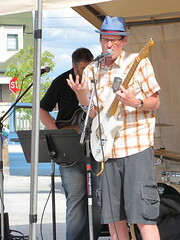 The guitarist of the band Nigel Mustafa performs at the June 2012 Beacon Rocks! Photo by Wendi Dunlap. “Save the Whale” at Sunday’s Beacon Rocks! 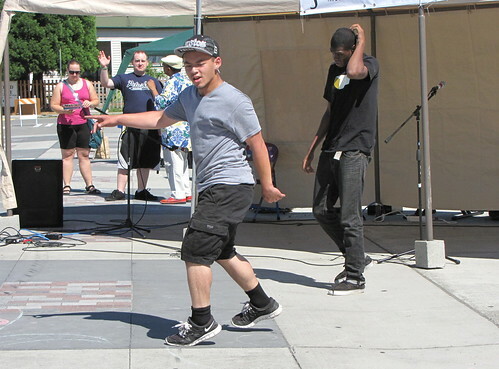 event, with an afternoon full of performers, wading pools, a volleyball contest, and a “Save the Whale” haiku contest. 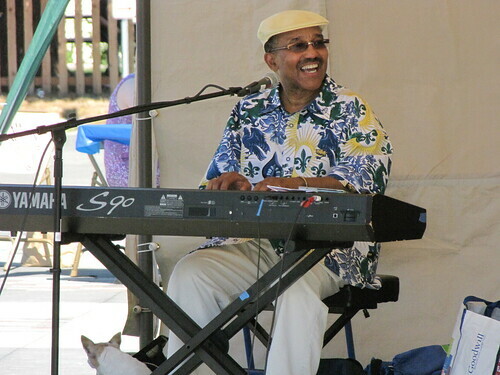 The day’s performance schedule includes bands, Zumba demos, and poetry, all on the Roberto Maestas Festival Street just north of Beacon Hill Station on Sunday, July 29, from 1-5 p.m.
Music, food, and color at yesterday’s Beacon Rocks! Yesterday’s Beacon Rocks! was one of the biggest yet, with multiple food carts and vendors on site to complement the music and poetry on the stage. The theme was Transportation (of all kinds), so representatives were there as well from Sound Transit, Feet First, and Beacon B.I.K.E.S. The weather stayed good, and by all accounts, the day was a success. Here are some photos of the event. All photos are by Wendi Dunlap unless marked otherwise. Did you take photos yesterday? We’d love to see them. You can submit them to the Beacon Hill Blog photo pool on Flickr. 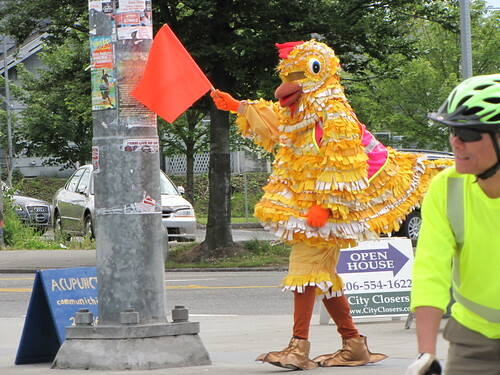 The Feet First giant chicken helped pedestrians cross busy Beacon Avenue. 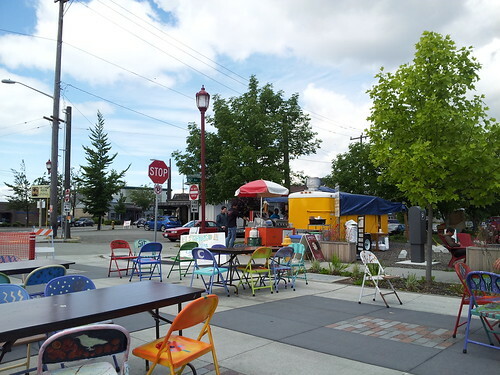 The new art chairs painted by neighbors last year made the site colorful and welcoming as the event opened to the public. 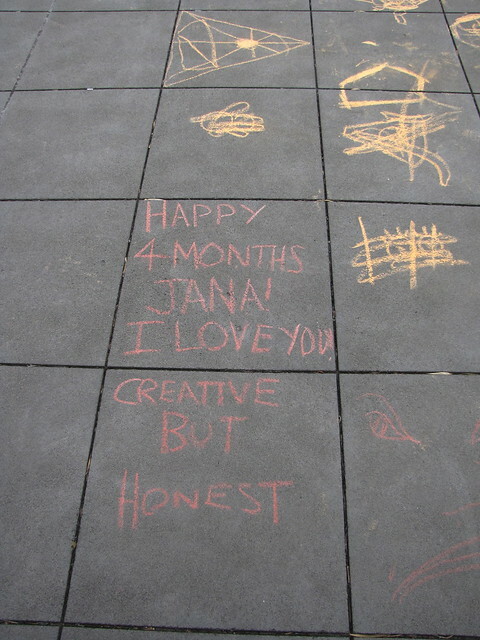 Photo by Melissa Jonas in the Beacon Hill Blog photo pool on Flickr. 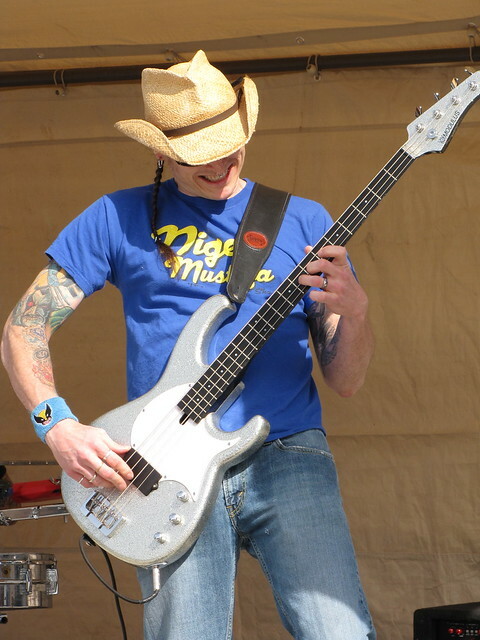 Bassist Anton Beck of the group Nigel Mustafa plays at Beacon Rocks! 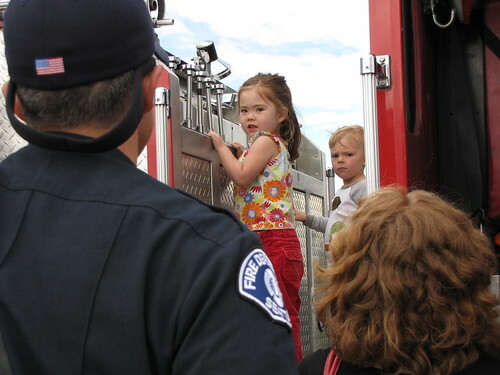 Neighborhood kids enjoy climbing around on a fire truck under the watchful eyes of parents and firefighters. 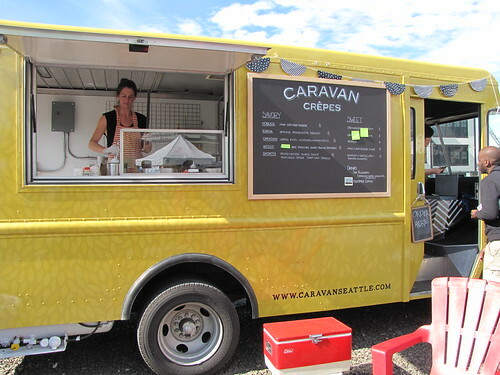 There were several food vendors at this event, including the taco truck that is usually at 16th and Festival Street, a hot dog cart, an ice cream cart, and this crepe truck, serving both savory and sweet crepes. 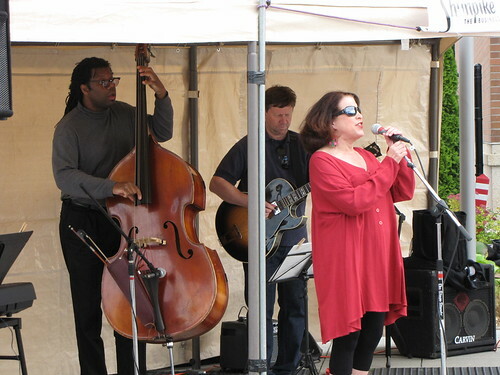 Joanne Klein sings. We are told she was a last minute substitute performer when the group Audio Couture had to cancel, but she did a fine job stepping in on short notice.